This is the third of a three-part series on how OpsRamp helps enterprise IT operations team manage the challenges of migrating to the cloud. Read part one here and part two here. Now that migration is complete, IT organizations will be responsible for monitoring and managing a mix of hybrid, multi-cloud resources across a distributed footprint. OpsRamp ensures comprehensive visibility, rapid remediation, and constant optimization for these dynamic, multi-cloud environments at scale. Policy-Based Discovery. DevOps teams can use OpsRamp to auto-discover cloud resources with API-based Discovery Profiles. OpsRamp’s Discovery Profile engine automatically assigns cloud resources to service groups and logically organizes cloud workloads once credential sets, policies, and cloud discovery schedules are defined. Business Service Maps. Cloud teams can create and share relevant service maps with business units so that they can monitor the IT services that matter to them. Figure 1 - Discover and dynamically onboard your cloud workloads with API-based discovery. Cloud Native Monitoring. Enterprises are increasingly hosting production-ready microservices on containerized workloads. OpsRamp can discover and monitor cloud native services built on Kubernetes clusters across both on-prem and cloud deployments. Robust Integrations for Cloud Monitoring Tools. 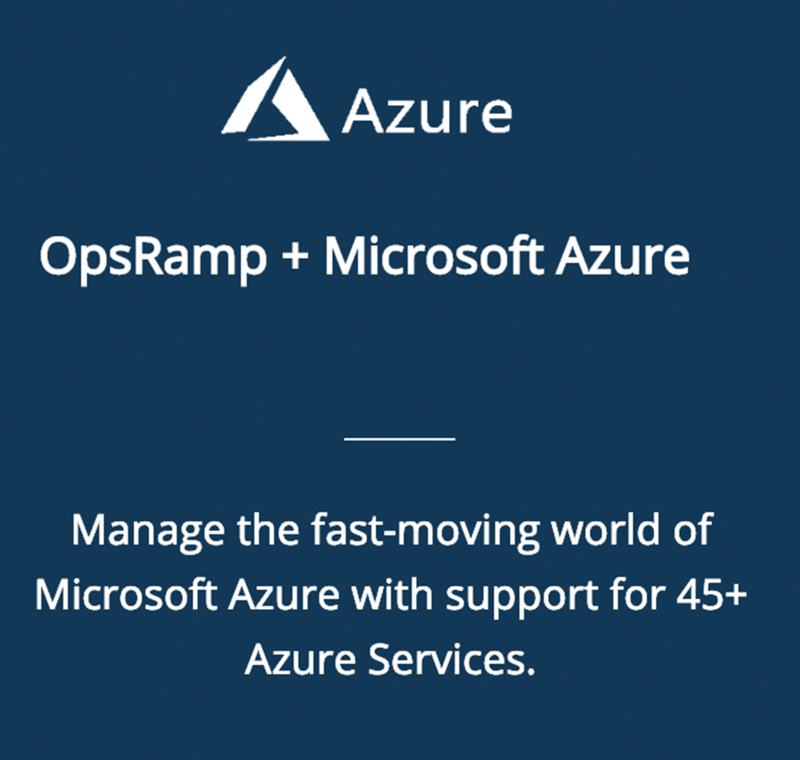 OpsRamp’s service-centric AIOps solution can ingest events from cloud monitoring tools like Amazon CloudWatch, Google Stackdriver, and Azure Monitor. The OpsQ event management engine processes and correlates raw events into contextual incidents so that IT teams can quickly troubleshoot issues with the right information. Auto Scaling Monitoring. 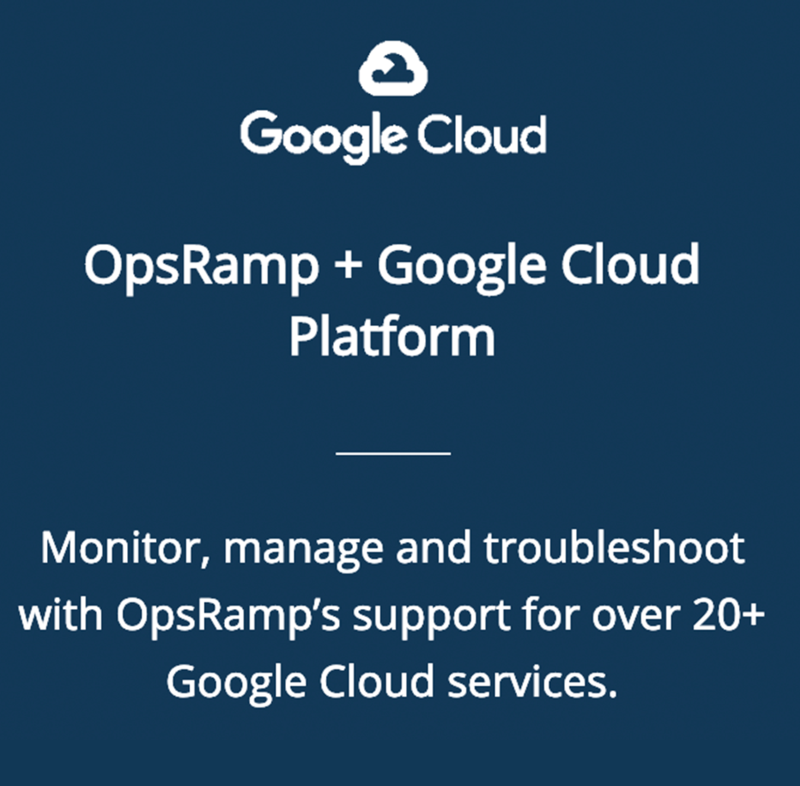 OpsRamp’s monitoring templates can manage auto scaling resources using scheduled or on-demand cloud discovery. Operational dashboards track the real-time performance of auto scale instances by displaying relevant infrastructure metrics and alert trends in a single place. Synthetic Monitoring. IT teams can detect network performance issues for cloud workloads with synthetic transaction monitoring. Synthetics deliver better performance visibility by tracking end-user experience across different geographic locations. Multi-Cloud Database Monitoring. Optimize and finetune the performance of database-engine level health with metrics and smart alerts for Amazon Relational Database Services (Aurora, PostgreSQL, MySQL, MariaDB, Oracle, and Microsoft SQL Server), Microsoft Azure (SQL Database, Azure Database for PostgreSQL, Azure Database for MySQL), and Google Cloud Platform (Cloud SQL). Cloud Event Monitoring. Events from cloud services are a primary source of signal for the health and performance of public cloud environments. 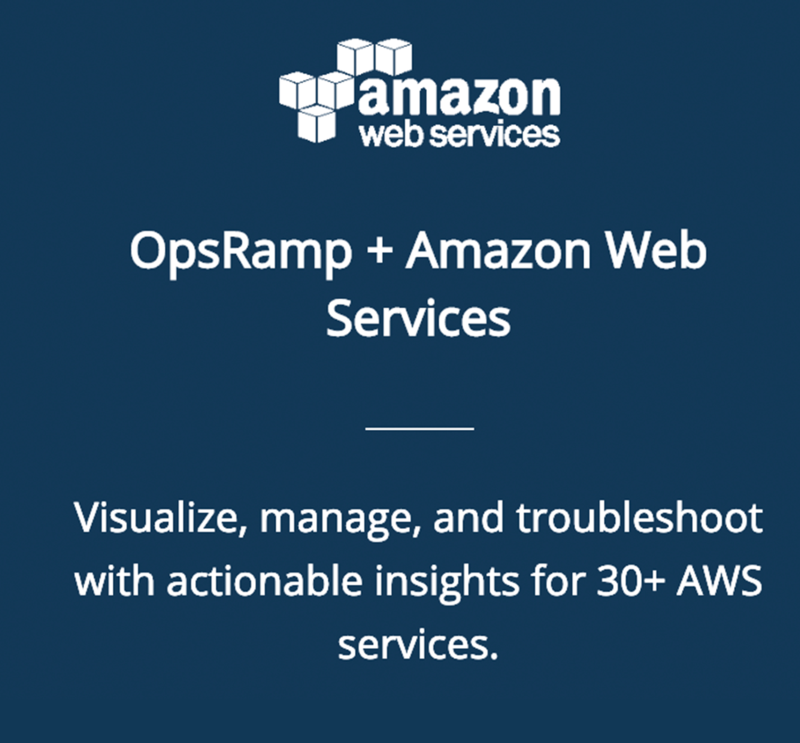 OpsRamp collects and monitors events for a wide variety of cloud services like AWS Health, Database Migration Services, EBS, ECS, ELB, and Redshift. DevOps teams can make sense of critical cloud events in a single place, without having to log into multiple AWS accounts. Alert Escalation Management. Multi-channel alert notifications and multi-level escalations help incident management teams be the first to know about an IT outage and reduce the mean-time-to-resolution with priority-based escalation matrices. Figure 2 - Ensure holistic visibility and control for your entire cloud ecosystem with OpsRamp. Cloud Cost Visibility. OpsRamp’s multi-cloud visibility dashboard lets IT leaders track cloud consumption across business units, IT services, resource types, and custom attributes. Finance teams can also create budget policies in OpsRamp to receive alerts when cloud budgets exceed allocated amounts. Patch Management. OpsRamp identifies missing patch updates across Windows and Linux servers and mitigate risk with automated patch deployment policies. Process Automation. OpsRamp’s built-in policy library helps standardize hybrid infrastructure management with automated remediation for streamlined execution. Audit Trails and Process Training. Remote consoles not only enable secure access to hybrid infrastructure but also deliver reliable audit trails through automatic session recordings. Session recordings help train staff on the right approaches to troubleshoot and resolve cloud-related issues. Cloud migration doesn’t have to mean a loss of control. With OpsRamp, IT teams can maintain the visibility, intelligence, optimization, flexibility, governance, and automation they need throughout their cloud journey. And they can do it entirely on their terms. To learn more about how to control the chaos of the modern, hybrid, multi-cloud world, schedule your custom demonstration today.